How to watch Kiss Me First: Season 1 (2018) on Netflix Netherlands! 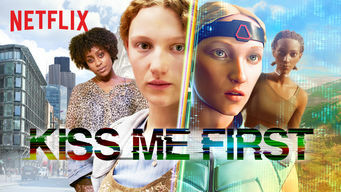 Yes, Kiss Me First: Season 1 is now available on Dutch Netflix. It arrived for online streaming on June 29, 2018. We'll keep checking Netflix Netherlands for Kiss Me First: Season 1, and this page will be updated with any changes. A lonely young woman hooked on a virtual reality game befriends a party girl who leads her into a world of new thrills and dark secrets. In one life, she's a loner. In the other, a warrior. But a twisted game is about to bring her two worlds crashing together. Season 1 of Kiss Me First has 6 episodes. Because different Netflix countries have different availability for episodes, you'll need to check the episode listing below to see which are available in the Netherlands. Alone and adrift after her mother's death, Leila throws herself into the virtual world of Azana, where she discovers a secret realm run by outsiders. As Leila navigates her new friendship with Tess and spends more time in Red Pill, she's haunted by troubling questions about Calumny. Convinced that something terrible is about to happen, Leila tries to bring Tess to her senses and make contact with Denier. While Leila races to find Tess, Adrian lures Force to London for a mission, and Jonty grapples with his guilty conscience. Tess arrives at a mysterious mansion, where she meets another member of Red Pill. Leila's journey with Kyle takes an unsettling turn. As Adrian toys with his new captive, two friends team up for a rescue mission, and Azana execs scramble to contain the damage from the scandal.